I have a friend who is currently training to run a marathon and she has cut the refined sugar out of her diet. I totally admire her for her efforts in this venture so I decided that I wanted to bake her a treat while challenging myself at the same time to bake with some alternative ingredients. I initially went the banana bread route, but my ingredient amounts were off and it didn’t come out as I desired so I will revisit that one at a different time. 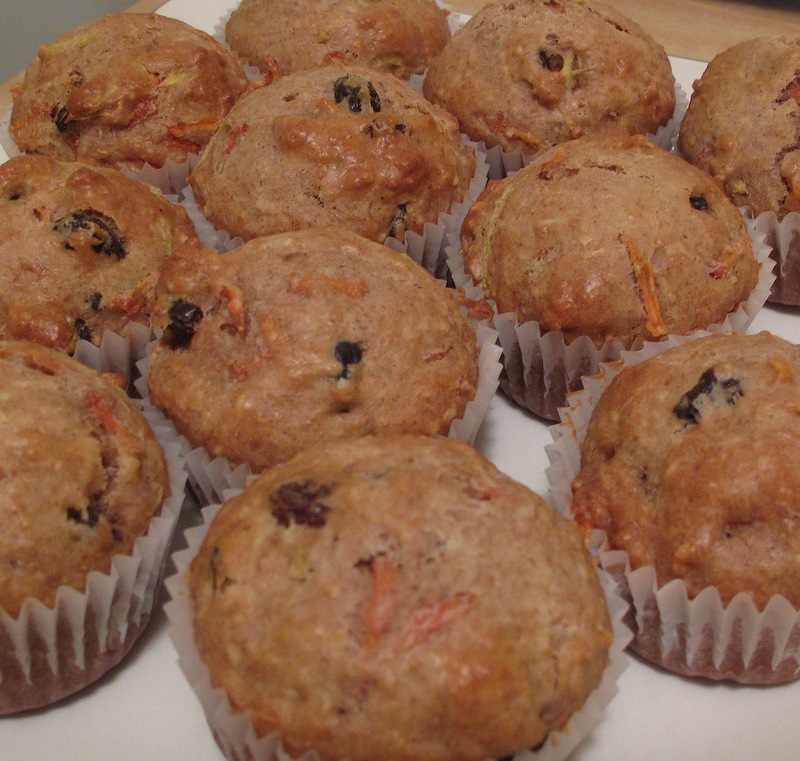 I then moved on to muffins and carefully chose the ingredients based on their health benefits, and the result was Carrot, Coconut & Raisin muffins. Some of the substitutions to the usual muffin ingredients that I made are highlighted below with their health benefits. Instead of Butter or Vegetable Oil, I used Canola Oil. It is low in saturated fat, high in monounsaturated fats and contains essential omega 3 fatty acids. It has a fairly light and mild flavour so it is a great substitute in most cooking. Instead of using the full amount of All Purpose White Flour, I used half Whole Wheat Flour. Whole grains have been proven to decrease the risk of diabetes and cardiovascular disease and pop a little more fiber into your diet. I did half and half in this recipe as whole wheat flour is fairly dense and I didn’t want these to be heavy lumps. You can use Whole Wheat pastry flour if you want to go all the way with whole grains and it will provide a lighter effect. Instead of Sugar, I used Raw Agave Syrup. There is some controversy behind the health benefits of agave, but essentially it is natural and has a low glycemic index so it won’t cause sharp rises or falls in blood sugar. And just a fun fact for you, Aztecs used to use agave syrup on wounds because of its antibacterial properties. I used Unsweetened Shredded Coconut. Coconut is higher in fat, but it is the good kind that is full of rich vitamins and minerals. Coconut has also been proven to decrease the risk of diabetes, cancer and crohn’s just to name a few. I used Raisins. There is a reason why hikers toss these little treats into trail mixes as they are high in energy and low in fat. The muffins are great without the icing, but after I had tasted one I wanted it to be just a little bit sweeter so I improvised an icing. 1. Preheat oven to 350º. In a saucepan mix all ingredients of the icing/glaze and bring to a boil stirring constantly. Remove from heat and place in fridge to chill. 2. In a bowl mix ap flour, ww flour, baking soda, baking powder, salt, cinnamon and nutmeg. Stir in coconut. 3. In another bowl beat eggs. Stir in canola oil, agave, vanilla and milk. Fold wet ingredients into dry ingredients. 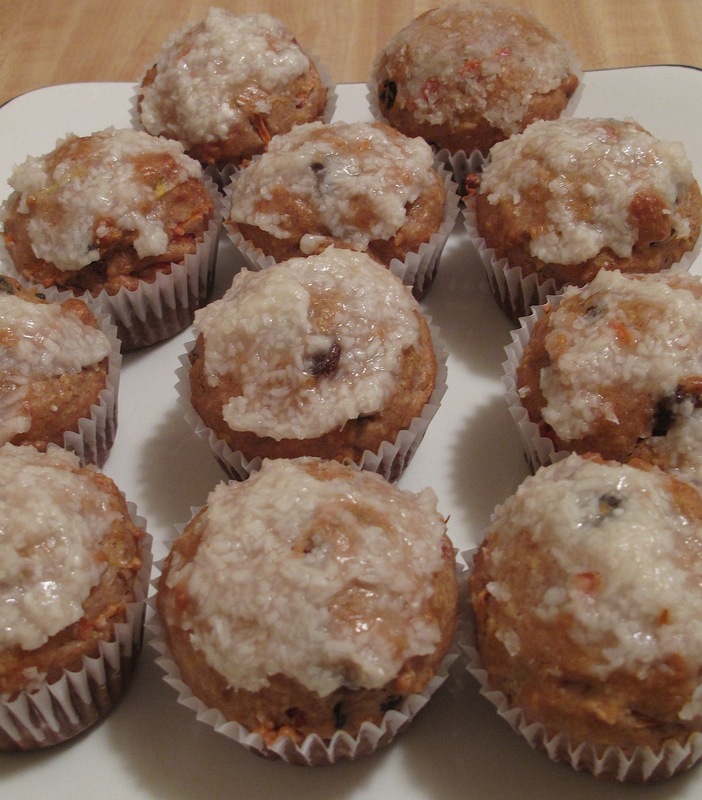 Stir in carrots and raisins just enough so that they are moistened, do not over mix. 4. Pour into a paper lined or greased muffin tin. Bake for 20 minutes. 5. Wait until muffins are cooled and put a thin layer of the icing/glaze mixture on top. 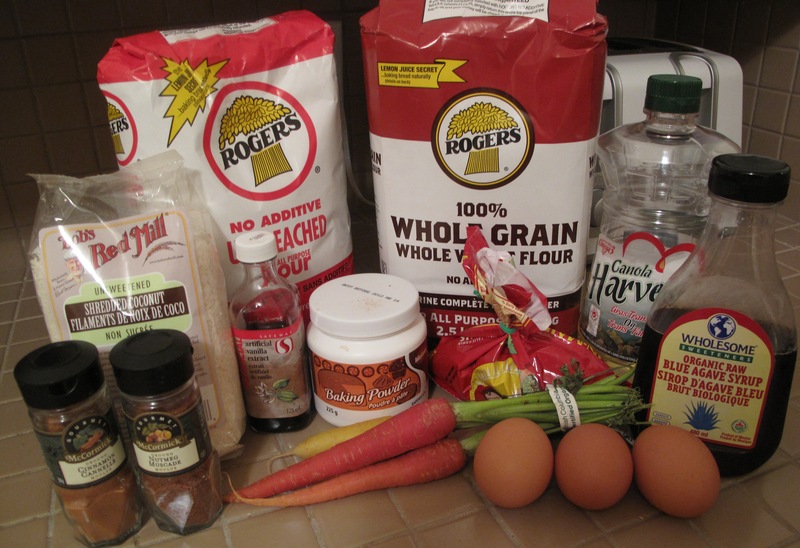 This entry was posted in Baking, Health, Muffins, Recipes and tagged agave nectar, agave syrup, baking, carrot, coconut, food, healthy, muffins, raisins, Recipes, refined sugar free, whole wheat flour by Karina. Bookmark the permalink. Thanks again for stopping by my little spot in the blogosphere. 🙂 Your muffins sound fabulous – I really should start looking at baking healthier.